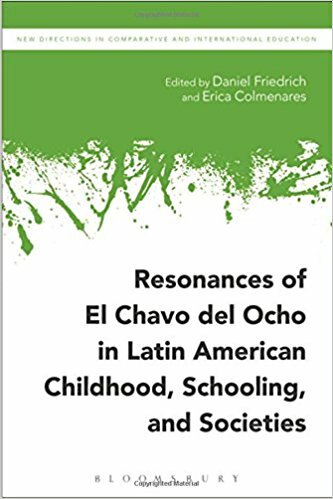 Abstract: Resonances of El Chavo del Ocho in Latin American Childhood, Schooling, and Societies analyses the phenomenon of El Chavo, and its images of schooling and childhood, Latin American-ness, class and experience. With contributions from scholars emerging from or based in countries including Brazil, Mexico, Chile, Puerto Rico, Argentina, Venezuela, Colombia and the US, the book combines reflections from a variety of international perspectives without attempting to compare or reach consensus on any ultimate meaning(s) of the work. The book explores themes such as images of schooling and childhood, romantization of poverty, the prevalence of non-traditional families and the bordering cynicism towards the economic structures and inequalities which, some argue, make the show transgressive and quite uniquely Latin American. Investigating the connection between visual culture studies and transcultural curriculum studies, this innovative title provides scholars with original new insights into conceptualizing childhood, schooling and society in Latin America.